(AFP) - Madagascar released early partial results on Thursday the day after its presidential election, with both candidates claiming victory in a head-to-head duel that has raised fears of instability on the Indian Ocean island. The vote count is set to be tense as Andry Rajoelina and Marc Ravalomanana, both former presidents, hope to emerge on top after a drawn-out election process hit by allegations of fraud. Preliminary results were declared for six percent of polling stations and 750,000 votes -- out of 10 million registered voters -- with Rajoelina in the lead with 57 percent and Ravalomanana on 43 percent. Amid calls for rival supporters to be patient, election authorities have said the count should produce a winner after Christmas. Local media on Thursday highlighted Rajoelina's early advantage. "Andry Rajoelina is in the lead," headlined L'Express. "Andry Rajoelina is slowly moving towards Iavoloha (the presidential palace)," added La Verite. Late on Wednesday, Rajoelina told his supporters: "I am sure I'm going to win but we'll wait for the official results." Meanwhile Ravalomanana, nicknamed "Daddy" said: "Change is coming tomorrow, and today you can say that 'Daddy' is elected." Ravalomanana said he would reject the result if there was fraud, while Rajoelina's camp has already alleged it is the victim of cheating. 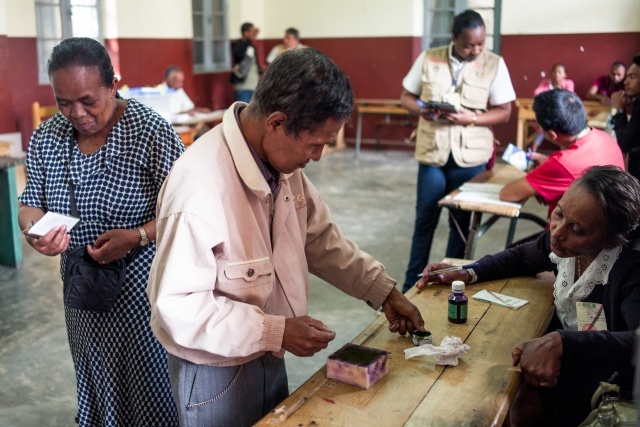 The long-time rivals, who came a close first and second in November's first-round vote, were both banned from running in the 2013 election as part of an agreement to end recurring crises that have rocked Madagascar since independence from France in 1960. The EU observer mission, which said turnout was around 50 percent, called for candidates and their supporters not to take to the streets until official results are announced. Complete results are due by January 9, although they are widely expected to be announced next week. Former education minister Paul Rabary, a fringe candidate who was eliminated in the first round, warned that a disputed result, fraud allegations and legal challenges could lead to another political crisis for the island. "I'm sure there will be problems," he said. "The next president will not be the one who was elected at the polls but the one who succeeds in imposing his victory."